This Stage 2 clutch kit assembly provides an estimated 80% increase in torque capacity and is properly suited for aggressive street use and moderate track use. The Carbon Kevlar material with its alloy backing matched to a performance pressure plate will provide smooth engagement and extended life. 500 mile break-in highly recommended with this set-up. 300 mile break-in REQUIRED with this set-up. The included Ultra Lightweight Flywheel made from 4140 forged steel tips the scales at only 9.25 lbs. This clutch kits fits 02A & 02J 5-speed transmissions only. Does not fit 02M 6-speed equipped vehicles! 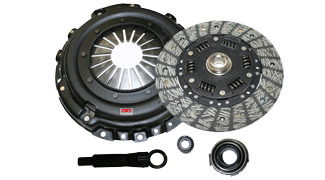 All BFI Clutch Kits are produced by Competition Clutch to our specifications. Competition Clutch brings the finest materials, and workmanship to the industry. Competition Clutch offers higher clamping forces, stronger disc designs, and uncompromised satisfaction, all at the most competitive pricing in the industry.